I've ordered a couple of sets of these tires lately for gravel riding. I'm running them tubeless and they set up without issue on multiple different wheelsets and don't leak or burp too easily. I wouldn't suggest running them at terribly low pressures though. Rolling resistance is low, price is low, satisfaction is high. Got the product quickly. Haven't used the new tyres yet but the last pair I had of these were solid and worked well for gravel, road and single track. Great as usual. My wife liked the texture too, so now her non-tubeless wheels have it as well and it fits great. She is more than happy! Excellent tyres. Fitted to an On One Pompino used for commuting and has transformed the ride completely. Riding at 80psi, grippy as hell, comfortable and confidence inspiring. A little more drag than the road tyres I had on before, but nothing to worry about. I think these will be my new go to tyres. I got a pair of these for my wife's gravel bike. Now I want a pair. I couldn't find these cheaper anywhere else. They were easy to fit and a well balanced tyre to use switching from road, to bridleway to fire road and mild single track. They would struggle in the mud but I didn't buy them for that. Amazing tyres. I didn`t realise they would be so fast rolling, they seem to cope with everything other than deep mud. Since I out these on my adventure/ gravel bike I`ve kept up with road crew in the chain gang and roamed over the countryside in the wet. Awesome tyres, don`t hesitate. My second round of G-ones, and still happy. Great blend between racer and offroad, even great on icy streets. I hope I can get through the winter without accidents, so far so good! Great service and price from Merlin. Superb tyres, roll well on the road and grippy off it. Very awesome all round tyres. Got these for the winter months of commuting. Have left them on through spring and now summer. The uneven surfaces of Melbourne commuting actually make these 35mm size tyres just perfect for me. I can`t get myself to get back on my 25mm road bike. Fast delivery. Good value. Also fitted a set of 40mm onto my partners touring bike. Excellent on most terrain except mud. Also fast and quiet on tarmac. Great all-round tires for anything from gravel to commuting. Seem like great tyres. 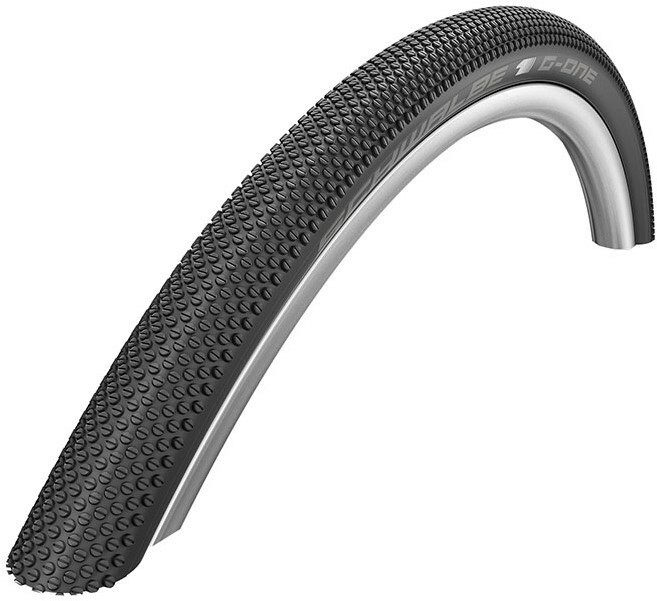 Used on a three day tour with road and gravel tracks- good grip, decent rolling, and no issues with punctures. So far these have been great. Very comfortable and feel good on a variety of surfaces. Nice gravel tire for mixed riding. The tire came quickly as promised and great price. Nice tyres for winter, great grip with low rolling resistance on the road and give you the flexibility to explore more with your road bike. Put these on my adventure bike and they're super comfortable. Great tyres for a bit of lightweight off roading, they roll really well on tarmac too and that's with just 3 bars (45 psi), they are really easy to fit and are not overly noisy on the road, Merlin's price and delivery are still really good, I like them... can see me doing a bit more hard-pack riding, they aren't for mud !! I can't vouch for the longevity of these tyres yet, but they certainly perform well. Quiet and fast rolling on the road and provide really good grip in the loose stuff. They are quite light too compared to other similar tyres I've had. I will probably switch back to a knobbly tyre for the winter, but as a spring/summer tyre they perform really well. What a great tire for any price. This tire has made my asphalt commute smooth and is great on gravel. Quick delivery to Canada. I bought these for summer gravel riding with view to an improved road ride too. Also hoping they will make my first Roubaix pave experience better. First test ride - good grip on dry gravel and super smooth on pot marked Devon lanes. Superb. Really good on the road as well as trails. Be realistic off-road though - the tread pattern is small and will get clogged up with wet mud. They are great on drier surfaces and gravel. A very nice tyre. Would buy again. Great gravel and road tires. Grip well and the 38 size really absorbs the bumps in the road. Perfect tyre if your riding takes in beat up lanes, dirt tracks or pretty much anything bar sloppy mud. Awesome gravel tyre. Works great on pavement as well. HIghly recommend this. Fantastic tyres, do what it says on the tin. Using them on wet slippery tarmac and gravel paths, stick to the road like glue. Buy them! These tires are remarkable. They can handle surface much more severe than gravel. Fast on the road, too. I run with tubes, and have not experience any flats after several hundred, hard KMs. Gorgeous tires! Ride awesome. Use for intense urban cycling. Hills, decent's, dirt trails, hop or two. Schwalbe kills it. Excellent on the road and very rough, single track and gravel trails. Cannot speak to their longevity yet, but initial impressions are great. They do it all, and do it well. They went on easy and have a great feel to them. They're fast on pavement and feel safe on sand and gravel. Exactly what I was looking for. I'm running them tubeless and have had zero issues so far. I hope to get a long life out of them. Really great tyre on both road and loose surface. Went on easily with a healthy thud when they seated. Added to that, an absolute bargain at Merlin, by far the cheapest I could find. Beautiful tyres fast and good grip. Just what I was after for the do everything bike. Excellent Product that suits purpose. Bought to keep as a lightweight spare for my touring bike. Easy to fit and takes little space in my pannier.